By the age of 22, Mr Ng Ting Wei had already spent over five years of his life in prison. His first brush with the law was when he was caught selling illegal VCDs at the age of 16. Later that year, he was arrested while unpacking contraband cigarettes in a warehouse. Mr Ng, now 25, was then sentenced to two years of probation, where he had to stay in a hostel. But he often ran away to meet up with fellow gang members. His parents were struggling with a failing family business so he was left on his own most of the time. "I was bored and wanted more friends," he said of his younger self. "The gang members gave me that sense of acceptance." Mr Ng catching up with prison chief warder Ramesh V. Packrisamy, 46, a reintegration officer, and Mr Koh Shukai, 31, assistant director at the Care Network office. Both men played a big role in helping Mr Ng turn his life around. Mr Ng stays in contact with Mr Koh, and both of them are more like friends now. Ultimately, the change has to come from oneself. I was tired of going in and out of jail. 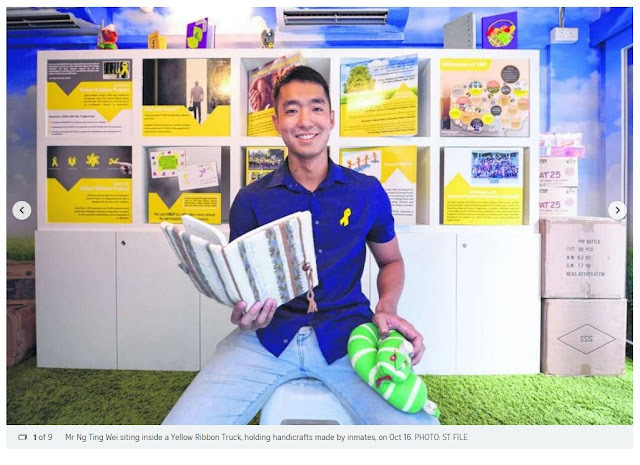 MR NG TING WEI, on how he made the decision to turn his life around. During a urine test, he was found to have consumed drugs. He was sent to the Reformative Training Centre (RTC) and spent most of the next five years in and out of prison. "I knew my actions were wrong, but at that time I didn't realise the full extent of the consequences," he said. While in prison, Mr Ng picked up reading, out of boredom. "I started reading novels and when I ran out of books to read, I would read the dictionary," he said. His family, who visited him regularly, supplied him with the religious books that he asked for. Reading was his main pastime, but soon Mr Ng found himself yearning for a more meaningful life. His lowest point in prison was on his 21st birthday. "I should have been out celebrating with friends," he recalls sadly. 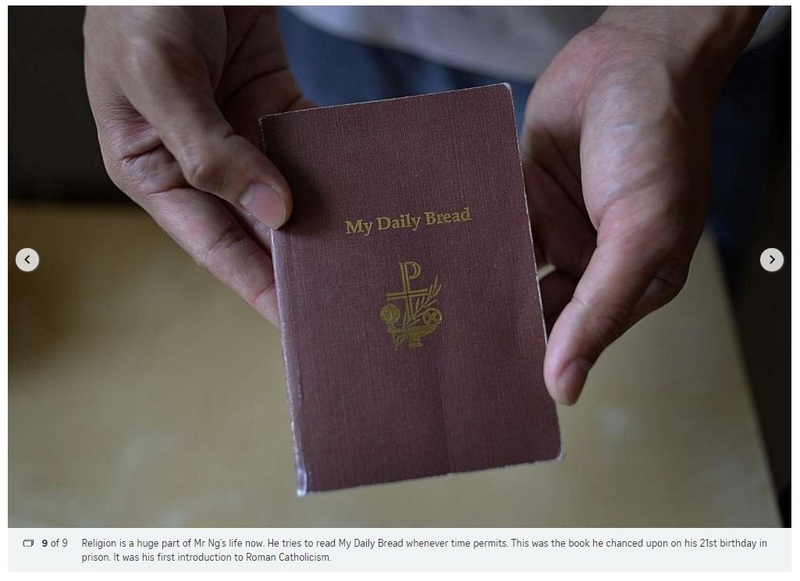 It was also on this day that he chanced upon the book, My Daily Bread, a compilation of spiritual and reflective readings, and started reading it. That was Mr Ng's first introduction to Roman Catholicism, which now plays a huge part in his life. 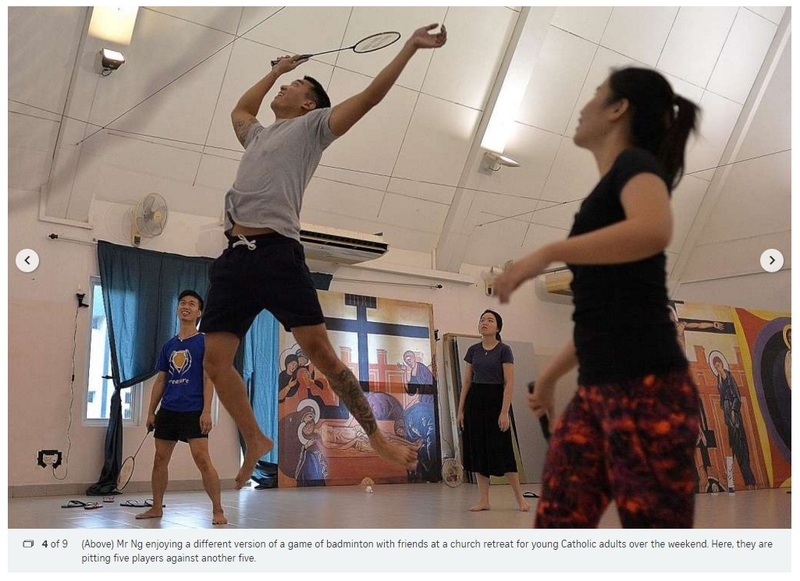 Mr Ng enjoying a different version of a game of badminton with friends at a church retreat for young Catholic adults over the weekend. Here, they are pitting five players against another five. 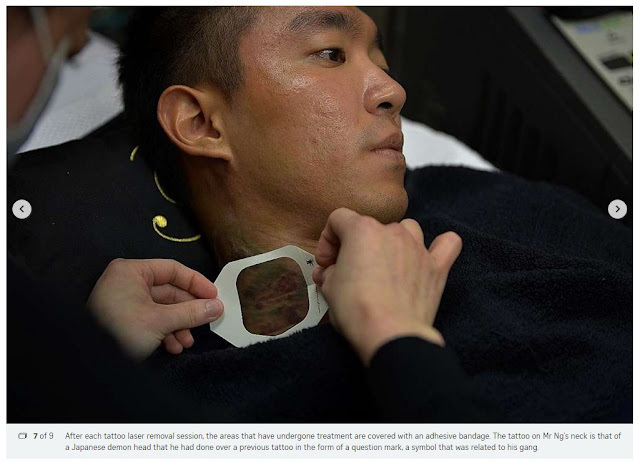 In 2012, Mr Ng made one of the biggest decisions in his life - to sever his ties with the gang. That was his first step to turning his life around. "Ultimately, the change has to come from oneself," he said. "I was tired of going in and out of jail." In October 2012, at the age of 22, Mr Ng was finally released and placed on supervision. With the help of the Yellow Ribbon Project, he enrolled in a diploma in construction and engineering course, which he recently graduated from. The Yellow Ribbon Project also funded his studies and provided a monthly allowance for Mr Ng. 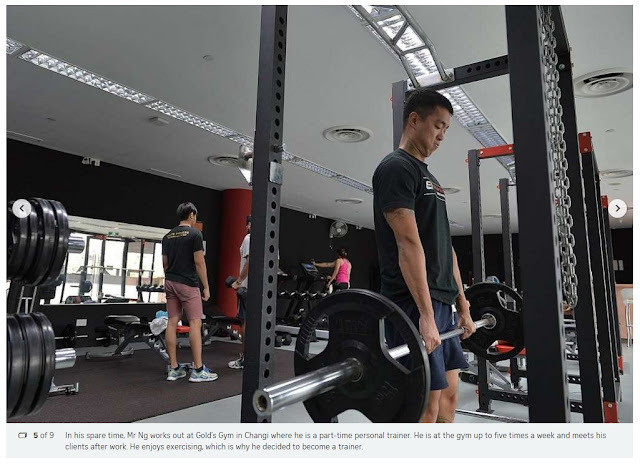 In his spare time, Mr Ng works out at Gold's Gym in Changi where he is a part-time personal trainer. He is at the gym up to five times a week and meets his clients after work. He enjoys exercising, which is why he decided to become a trainer. His biggest challenge, when trying to assimilate back into society, was building up a sense of confidence again. "My first group of new friends was from church. 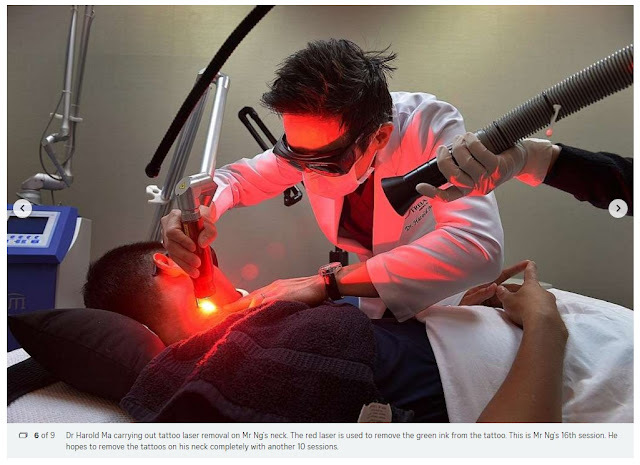 I didn't know how to interact with them initially so I observed what they did and listened to how they spoke," he said. 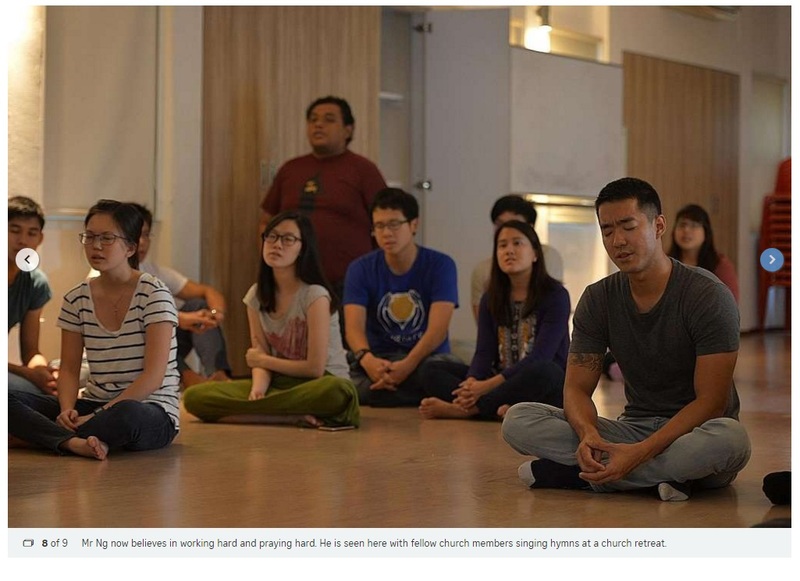 These days, Mr Ng packs his schedule with work and church activities. He found himself a full-time job as a quantity surveyor and is a certified personal trainer at Gold's Gym, where he trains clients and works out up to five times a week. He has also applied for a degree course in construction management and, if accepted, he will start school in January next year. "The world is a big place and there is so much more I can strive to do," he says confidently.